Sumatran and Tapanuli orangutans are found only on the Indonesian island of Sumatra. With just over 13,000 Sumatran orangutans, and approximately 800 Tapanuli orangutans individuals left in the wild, both species are in critical danger of extinction. The only remaining contiguous populations of the Sumatran orangutan (Pongo abelii) that still number over 1,000 individuals all occur within what is known as the Leuser Ecosystem, which straddles the border between the provinces of Aceh and North Sumatra, covering around 2.6 million hectares, the Leuser Ecosystem is the largest rainforest ecosystem conservation area in Southeast Asia and home to over 85% of all remaining Sumatran orangutans. It is also probably home to the last remaining viable populations of Critically Endangered Sumatran tigers and Sumatran rhinoceros, as well as Critically Endangered Sumatran elephants and countless other rare and threatened species. 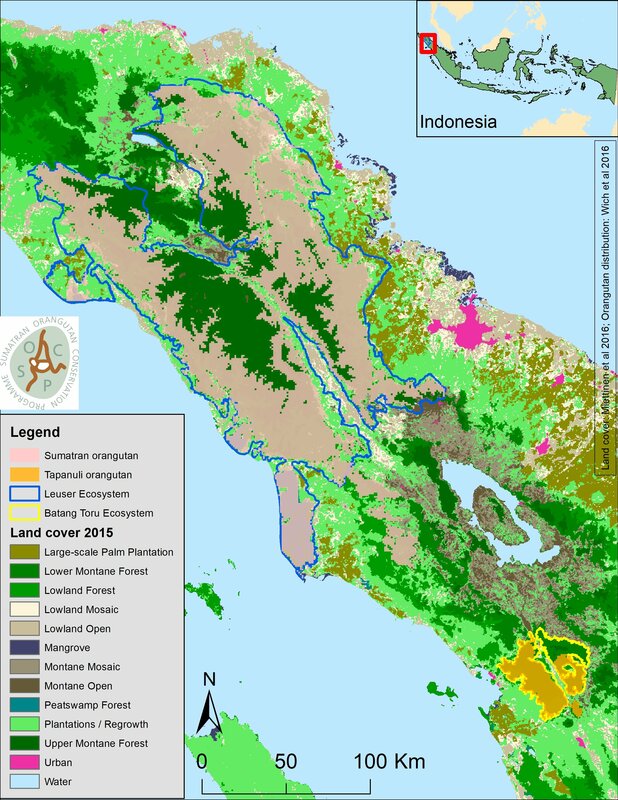 Unfortunately, despite being protected under several Indonesian laws, parts of the Leuser Ecosystem are still threatened by logging, palm oil and mining concessions, and illegal logging and encroachment. A well publicised example of this is in the Tripa peat swamp forests, on the west coast of Aceh. Tripa is being cleared and burned to make way for large scale palm oil concessions and despite some success in slowing down the pace of Tripa’s destruction, as a result of campaigning by the SOCP and partners, there is still a real possibility that Tripa’s peat swamp forests and their orangutan population will be gone forever in as little as one or two more years. Another major threat to the Leuser Ecosystem and its orangutans and other wildlife is the construction of new roads, several of which are proposed within its boundaries. These roads will further fragment the forests and the orangutan populations they support, into ever smaller, potentially non-viable units. Roads through forests in Indonesia also tend to be followed by illegal encroachment and increased poaching and hunting of wildlife. All of the remaining wild Sumatran orangutan populations are already struggling to hang on and new roads will add significantly to the list of threats they already face. Estimates of remaining orangutan numbers have declined dramatically over the last two decades due to habitat loss. According to the most recent survey results published in 2016, only around 14,000 Sumatran and Tapanuli orangutans remain in the wild today. Without doubt, with current rates of habitat loss the continued survival of the two species is under serious imminent threat. Now, more than ever, we must intensify the fight for the survival of this species!